* Senior club appearances and goals counted for the domestic league only and correct as of 19:00, 2. december 2017 (UTC). 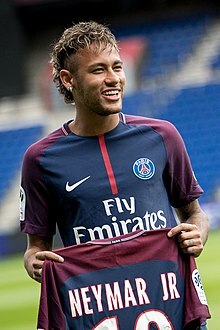 Neymar da Silva Santos Júnior (føddur 5. februar 1992), vanliga kendur sum Neymar ella Neymar Jr., er ein brasilskur fótbóltsleikari, ið spælir sum álopsleikari fyri franska felagið Paris Saint-Germain og Brasilska fótbóltslandsliðið. Frá 2013-2017 spældi hann fyri spanska La Liga felagið FC Barcelona, har hann vann spanska meistaraheitið tvær ferðir. Hann vann olympiskt gull við Brasil í 2016 og silvur í 2012. ↑ 1.0 1.1 1.2 1.3 1.4 "Neymar". FC Barcelona. Archived from the original on 12 August 2017. https://web.archive.org/web/20170812023551/https://www.fcbarcelona.com/football/first-team/staff/players/2016-2017/neymar-jr. Heintað 11 August 2017. ↑ "2014 FIFA World Cup Squadlists". FIFA. Archived from the original on 11 June 2015. https://web.archive.org/web/20150611133541/http://www.uefa.com/uefachampionsleague/news/newsid%3D2255077.html. Heintað 7 February 2015. ↑ "Neymar". ESPN FC. Archived from the original on 10 February 2015. https://web.archive.org/web/20150210234556/http://www.espnfc.com/player/132948/neymar. Heintað 7 February 2015. ↑ "Neymar Jr will wear the No.10". Paris Saint-Germain Football Club. 3 August 2017. https://en.psg.fr/pro/article/neymar-jr-will-wear-the-no-10. Heintað 14. september 2017. "Paris Saint-Germain's new forward Neymar Jr will wear the No.10 jersey." Hendan síðan var seinast broytt 08:13, 9. des 2017.